Splash pages, you gotta love 'em. A blank canvas where the artist can hit you with a large dose of illustrated 'wow'. 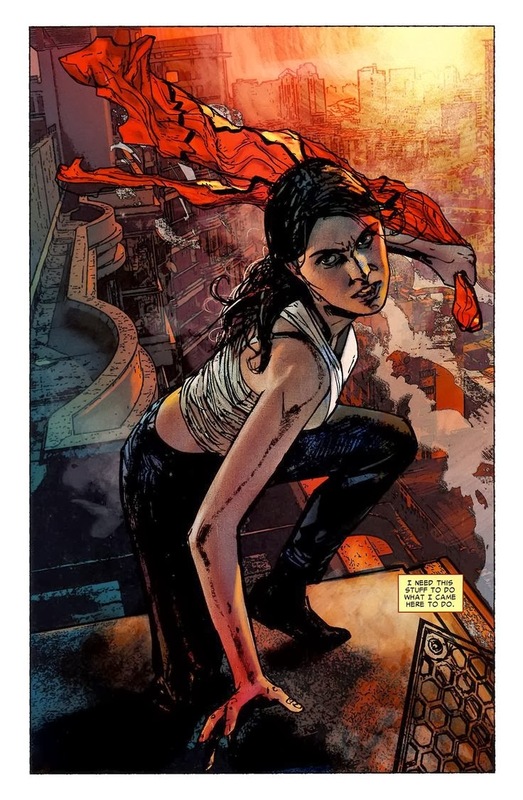 This week, Spider-Woman Jessica Drew, drawn by Alex Maleev. While you could almost say Alex's art in comics is almost as a bizarre an absence, Marvel's use of first Spider-Woman Jessica Drew has to be one of comics' biggest headscratchers. She's an Avenger (which is kinda a big deal right now), has 'Spider' in her first name, a history that ties into S.H.I.E.L.D., and has had her own self-titled cartoon, yet a solo series is no where on the horizon. As a kid addicted by the cartoons, if a comic even sneezed Spider-Woman I brought it. She's an icon of icons, and while her whole motion comic biz a few years back was a screw-up even before it left the station, as you can see from this here splashie, neither Jessica or Alex were responsible.